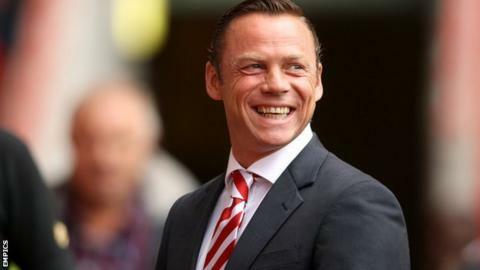 Doncaster boss Paul Dickov believes his side's hopes of staying in the Championship have been aided by having their experienced players available. Rovers, who travel to title winners Leicester, are one point above 22nd-placed Birmingham City. "More often than not when I have had all the players available this year we have performed and got results," Dickov told BBC Radio Sheffield. "We've got a lot of experience and a lot of quality going down there." Last season Doncaster travelled to Brentford on the final day of the season needing only a point to ensure promotion. The Bees needed a victory to go up instead of Rovers and were awarded a last-minute penalty. Loanee Marcello Trotta blasted his spot-kick against the crossbar and Doncaster went up the other end and scored through James Coppinger to seal promotion and the League One title. Doncaster need to equal or better the result of Blues - who face an away trip to Bolton - to stay up as their goal difference is vastly inferior to Lee Clark's men. The former Oldham boss is pleased that his side are in control of their own destiny. "I'm not going to deny that we weren't looking at Tuesday's game (Birmingham's home defeat by Wigan) because it has helped us out," he said. "We go into Saturday with our future in our hands - which is what we wanted. "If we win the game on Saturday then we stay up and if we draw then Birmingham have to win." Doncaster were promoted back to the second tier last season after one season in League One. Dickov admitted that staying in the Championship is integral to his plans for the club. "It was our aim at the start of the season to stay up and we were everybody's favourite to go down," the former Scotland international said. "I'm ambitious and it's important to me that, by hook or by crook, we stay in this division. "The board want me to build something for the future here and we need to make sure we stay up so that we can keep building on what we've done so far."